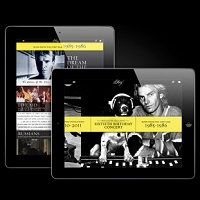 Today, the free iPad app STING 25 was updated with new content including three exclusive and previously unreleased performances from Sting’s 60th Birthday Benefit Concert - ''Brand New Day'' with Stevie Wonder, ''If You Love Somebody Set Them Free'' with Branford Marsalis, and ''Roxanne'' featuring Bryn Terfel - as well as a global PSA produced by @radical.media supporting the One World Futbol Project (OWFP). STING 25, which was recently awarded the prestigious Cannes Lion for Best Visual Design/Aesthetic at the Cannes Lions International Festival of Creativity, explores Sting’s enduring solo career through a multitude of elements, including handwritten lyrics and journal entries, rare photos, in-depth interviews, and a variety of concert footage, including exclusive performances and behind-the-scenes footage from his 60th Birthday Celebration benefiting the Robin Hood Foundation at New York City’s Beacon Theatre. Since its inception, the One World Futbol Project has positively affected more than 525,000 lives in 137 countries through more than 138 organizations - including schools, orphanages, and nonprofits - which use sport to resolve conflicts, teach tolerance, and build communities. The company is also an affiliate member of streetfootballnetwork, which connects 94 football-for-social change non-profits in 61 countries. In May, Chevrolet announced a three-year partnership with the One World Futbol Project, becoming the organization’s founding sponsor. Their pledge of support will result in 1.5 million virtually indestructible footballs being donated to youth living in communities impacted by war, disasters and poverty. You can help make a difference through One World Futbol Project’s ''Buy One, Give One'' program. For every ball you purchase, a One World Futbol will be donated to an organization working with disadvantaged communities around the world. To get involved, visit www.oneworldfubol.com or Chevrolet’s football site, www.chevyfc.com. The STING 25 app is available as a free download from the App Store on iPad or at www.itunes.com/appstore. ever since the most recent update, my app no longer plays the downloaded files from the 60th birthday concert. I've even tried removing them and redownloading them to no avail. They will only stream from the server, so if not connected to wifi I can't view them. Please fix this ASAP. Also the newest live songs that were added on this update do not have the option to download. Do you plan on making this available? Thank you. Member Exclusive Video: In this latest exclusive Virtual Ticket clip, Sting shares his thoughts on performing for various audiences in many different settings along the summer tour.